Week #2: Trying to jumpstart our immune system to fight off HIV. Fighting the good fight against HIV. In this weeks PDB releases, we see a couple of HIV-antibody structures, continuing the work of the Kwong and Mascola labs in the NIH. In 2011, these labs released a paper (published in Science) studying various antibodies that recognises and neutralise HIV-1. If you can recall your high school biology classes, antibody recognition of an invading pathogen is the first step in activating the immune system that hopefully results in successfully fighting off the infection. This work has been further developed with papers this year in Cell and Nature – Prolific and important work! 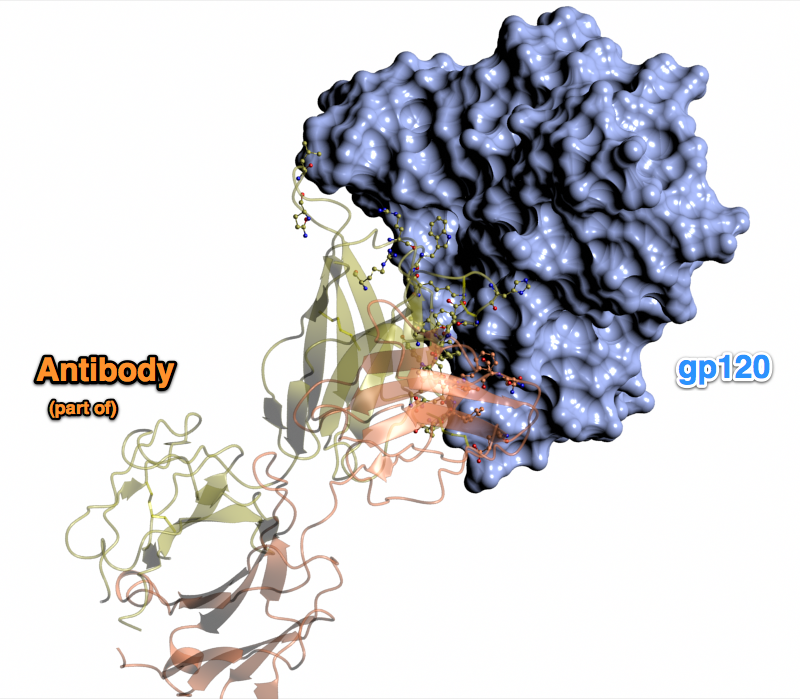 The structure shown below contains the “FAb fragment” (gold & bronze cartoon) of the antibody bound to gp120 (the big blue blob). Glycoprotein 120 (gp120) is a component of the HIV surface spikes – which recognise a range of different molecules on the surface of our cells and initiate infection. It is because of the this that gp120 is an attractive vaccine candidate – however, recombinant gp120 has failed deliver results in clinical trials, and it is hoped that by studying antibody-gp120 interactions and perhaps by designing a novel gp120-dervied antigen, an effective HIV vaccine can be developed. Other structures of note this week at the excellently named “star domain of quaking protein in complex with RNA” and some work looking at the mechanism by which angiopoietin 1 and 2 interact with the Tie2 receptor tyrosine kinase ([paper] | [PDB] ), which might lead to therapeutics that prevent tumours growing their own blood supplies (angiogenesis blockers).